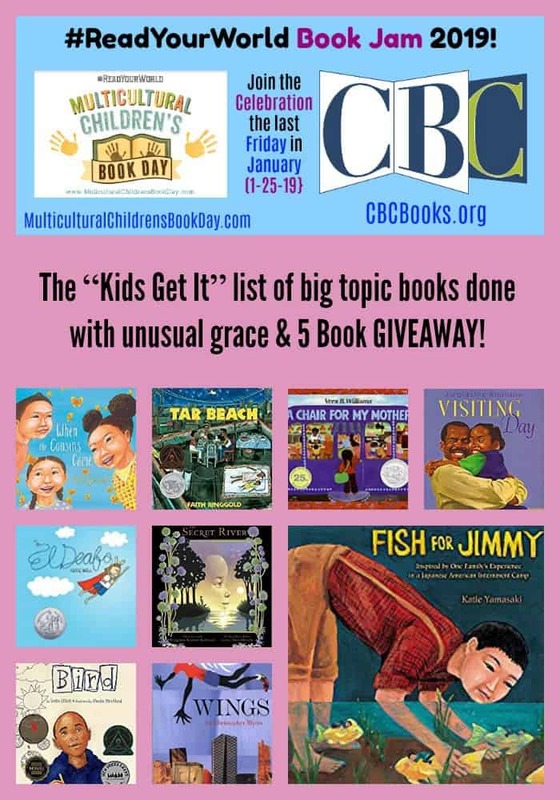 I chose the books on this list because every one of them tackles a big story with incredible eloquence, giving kids credit that they will understand the complexity of the world they inhabit, as told by the characters (all people of color) in the books. When the city cousins come to visit their cousin in the country, all the kids learn, through a weekend of play, that our differences make us better, give us more to share with one another and can actually bring us closer together. Fish for Jimmy 5 Book GIVEAWAY! We are giving away 5 copies of her picture book, Fish for Jimmy. Please fill out the Rafflecopter at below to enter. We can only ship to U.S. addresses. Katie Yamasaki is an artist based in Brooklyn, NY. She works primarily as a muralist, children’s book author/illustrator and teaching artist. I like this list because I’m currently reading books specifically which deal with difficult subjects. I like Kate Messner and Erin Estrada Kelly for those kinds of books. American Street, The Hate You Give, Dear Martin, and Long Way Down. This is a wonderful list of books! Thank you for your recommendations! I love A Chair for Mother, for how it discusses a tough topic, but it shows how the love of family helps one overcome.